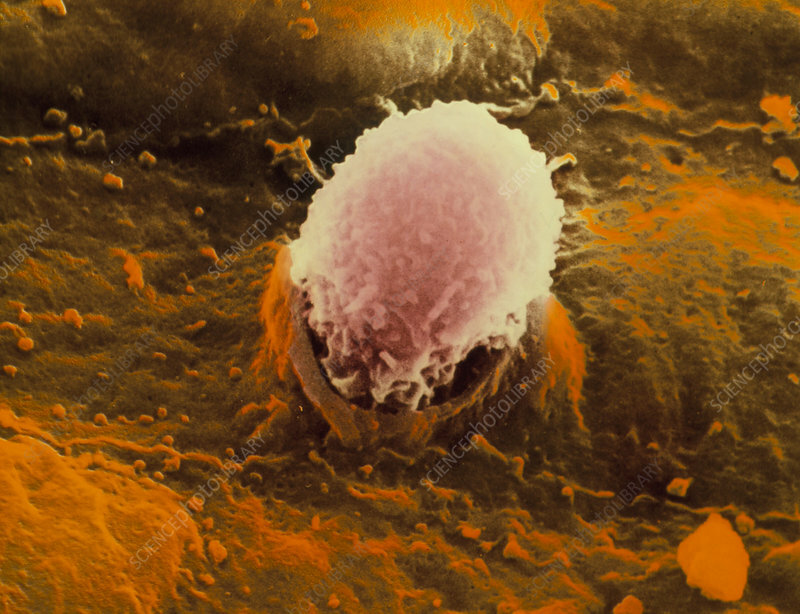 False-colour scanning electron micrograph of a white blood cell (leucocyte) migrating through the endothelium of a vein. The term leucocyte comprises three types of white cell: granulocytes, monocytes, & lymphocytes. They are collectively involved in the immune system, protecting the body from foreign substances & in antibody production. White blood cells are transported around the body by means of the blood, but emigrate from there to the surrounding connective tissue where they exercise their function. They exit from the blood vessels by passing through their walls, as shown here. Magnification: x3450 at 6x4.5 cm size.